Did you know that you can plan a trip to Malaysia at a short notice of 5 days? Well, yes, let us tell you more about it. With a huge influx of Indian visitors touring Malaysia, getting a Malaysia visa has become faster and easier. It’s obvious that if your purpose of visit is leisure, then you need to apply for a Malaysia tourist visa. If the purpose of your visit to Malaysia is commercial, then you have to apply for a business visa. Here are some useful tips and guidelines that will help you apply for a Malaysia tourist visa accurately, and avoid the risk of the application getting rejected. Unlike Dubai visa, Malaysia visa is not an e-visa and requires submission of physical documents. 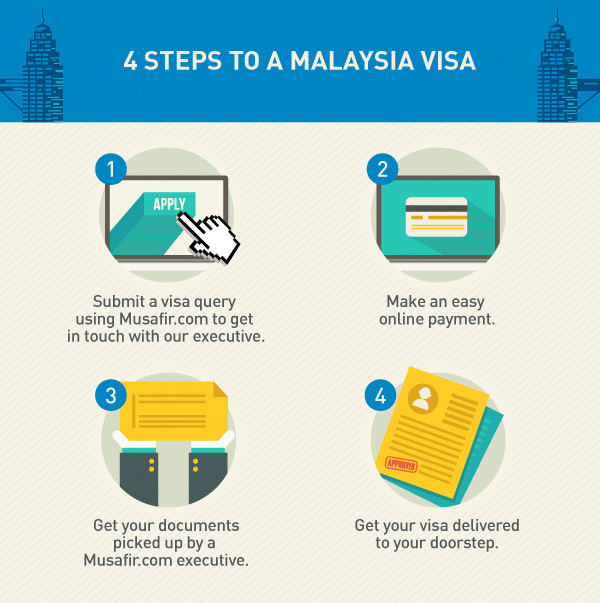 Now, get your Malaysia visa in 4 easy steps. 1. Contact us on +91-22-33951010 or email us at easyvisa@in.musafir.com. 2. Our travel experts will send you the details required for Malaysia visa. The detailed email will contain the documents required, Malaysia visa form, cover letter and the payment link. 3. After you make the payment online, our trusted representative will come at your doorstep and pick up the documents. These documents will be verified by our visa experts and sent to the embassy. 4. Voila, your Malaysia visa will then be issued! Your visa will be delivered to you safely by our trusted representative. All this happens smoothly and efficiently in just 5 working days, provided your documents are sorted. 1. Confirmed return air ticket to Malaysia. 2. Original passport valid for at least 6 months with 2 blank pages for the visa stamp. 3. 2 recent passport size photographs shot against a white background. The dimensions of the photo should be 3.5cms x 4.5cms with 70% face visibility. 4. Duly filled and signed Malaysia visa form (a sample will be provide by us for your reference). 5. Covering letter (a sample will be provide by us for your reference). 6. Bank statement for the last 6 months suitably signed and stamped by the bank official. 1. Indian passport holders are eligible to apply for a Malaysia visa that allows a stay of minimum period of 30 days up to 90 days. 2. It is mandatory to enclose the copy of your old passport along with the new one. 3. It is also mandatory to have a minimum balance of Rs 30,000 individually or Rs 60,000, in case the applicant is incurring expenses on behalf of the group. This will be testified with the one-month bank statement attested by the bank official. 4. Malaysia visa is a multiple-entry visa and can be used for entry-exit until its validity. 5. Apart from this, applicants should also have sufficient funds for the period of stay in Malaysia. Click here for more Malaysia Tour Packages. 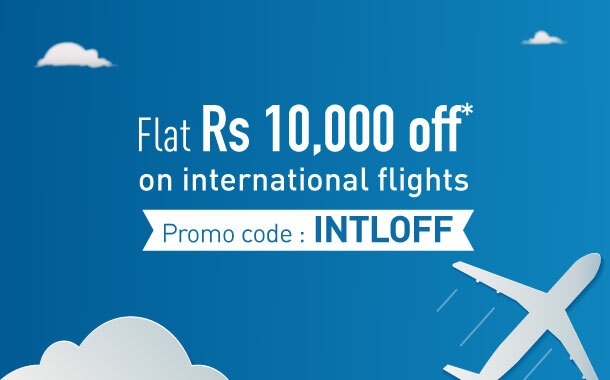 Get flat Rs 10,000 off* on flights to Malaysia & other destinations. Use promo code INTLOFF. Book now.